Skaldic Eagle Press, 9781947407060, 320pp. A rare poetic look into the path of Runic Initiation by the author of Viking Poetry for Heathen Rites. This is a book for initiates, magicians, occultists, esotericists, sages, heathen prophets, and other travelers of the hidden realms, one that will not be understood by others. For many years, The Nine Doors of Midgard by Edred Thorsson has been a guide to the esoteric mysteries of the Runic Tradition, used by initiates of the Rune-Gild. 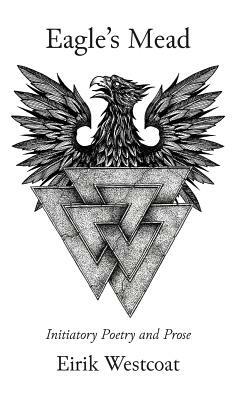 Eagle's Mead is a poetic and prose record of one initiate's journey through those Doors, which went beyond that curriculum to encompass not only the Runes, but the Mead of Poetry and the Grail Mythos as well. Inside, you'll find poems of aspiration and inspiration, poems of using the runes for self-transformation, poems in quest of the Mead and the Grails, and charms and other workings that can be adapted for magical or initiatory rites. Of particular note is a poetic commentary on the complete work of The Nine Doors of Midgard. Also, there are numerous Rune Poems, both poetic translations of the three major elder poems and new compositions in English, including a ground-breaking expansion of the Old English Rune Poem. Finally, there are tantalizing steps toward a Heathen Grail Mythos. Eirik Westcoat is a long-time Asatruar who has presented his award-winning poetry at several regional Asatru gatherings in the American Northeast. In addition to being a poet, he is also a scholar with a degree in Viking and Medieval Norse Studies who specializes in Old Norse mythology, poets, and poetry, with published articles on the galdralag meter and the meaning of the valknut. This is his second book of poetry.